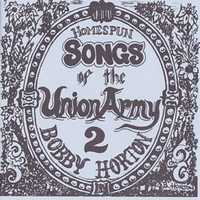 After Union volume one was well received, I decided to record some more of the great songs I had found in my research. There are some classic tunes here and I had a wonderful time recording them. As with all my other volumes, I played all the instruments, sang each part, did the liner notes and cover by hand, and recorded here in my home production studio (this music was recorded in 1990 on a Fostex 8-track analogue machine) – hence the "Homespun" in the title.